The hotel complex is nestled in Barcelona’s golden mile: the Paseo de Gracia. 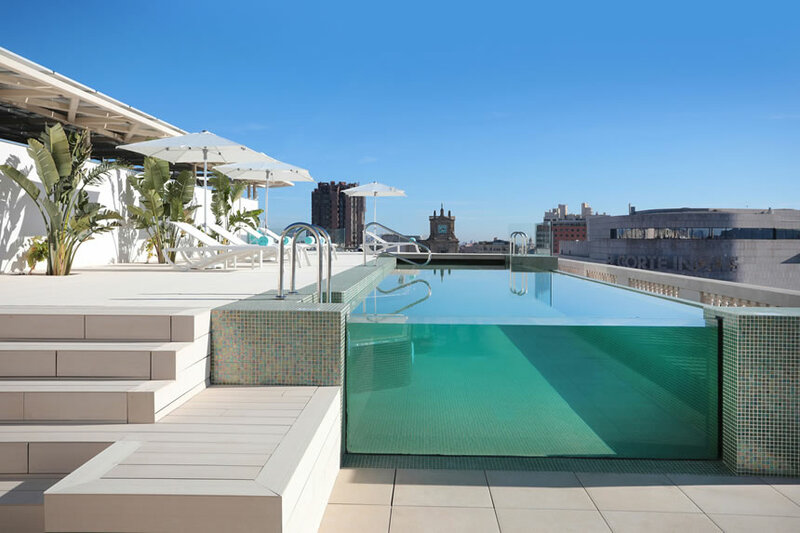 The view from pool—clad by Ezarri—takes in the very heart of the city: the Plaza de Cataluña. The versatility, beauty and safety of our pool mosaics are shown to best effect. 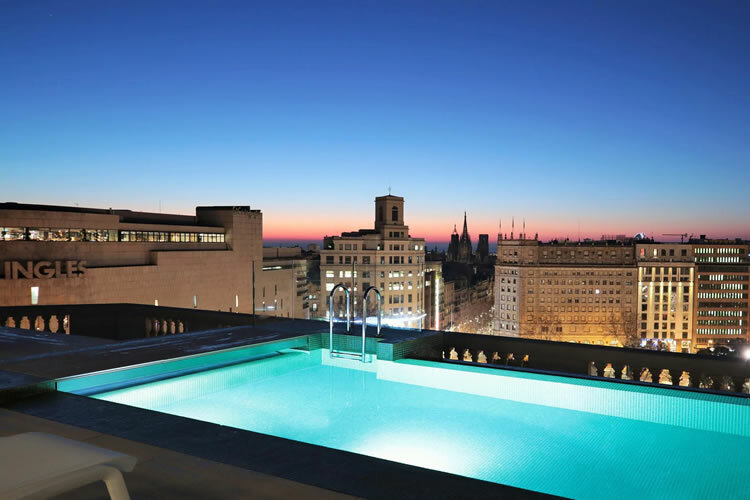 This versatility finds a perfect home on the walls of a pool located on the rooftop of a unique building, creating a relaxing environment above the hustle and bustle of the Catalan capital. Ezarri used the Green Pearl mosaic from its Iris collection for this project which showcases the beauty of pool mosaics. This green mosaic has an iridescent effect and is especially suited for cladding interiors, pools, spas, saunas and wellness spaces designed for relaxation and enjoyment. 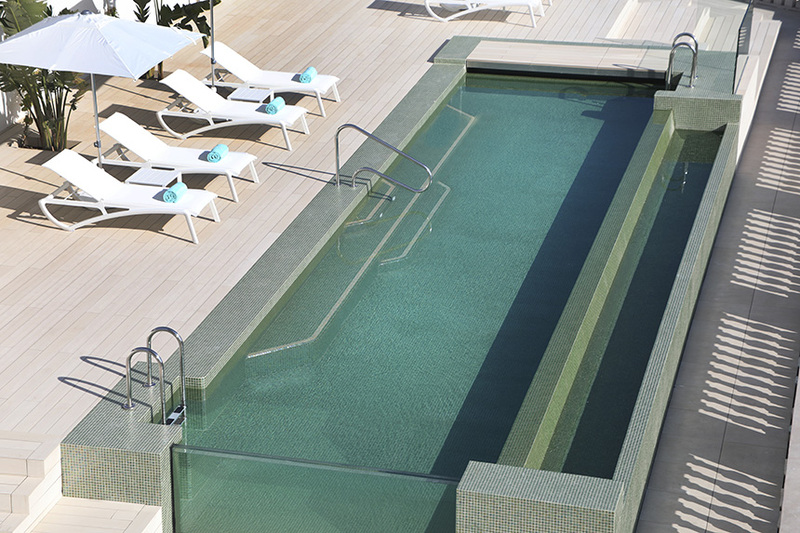 The iridescent effect of Ezarri´s Green Pearl pool mosaic creates different colours depending on your viewing position. That is to say, the colours will be different depending on the illumination angle. This mosaic also features Ezarri’s Safe Steps non-slip system, making it safer, smoother and easier to clean. Safe Steps has several advantages over previous non-slip systems. It has a smooth surface—gone are the days of a sandpaper feel—meaning that in addition to being much easier to clean and maintain, it is also much more pleasant to the touch. In other words, it has a smoother feel. The new Safe Steps collection achieves the perfect combination of the elegance of glass and the utmost non-slip safety. It is available in a wide range of colours and a variety of formats.